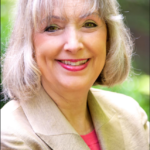 Our Palm Sunday Prayer was written to help you welcome Jesus Christ with thanksgiving and praise as residents of Jerusalem did thousands of years ago. However Palm Sunday is also connected with tears for people who have not responded to Christ’s love. 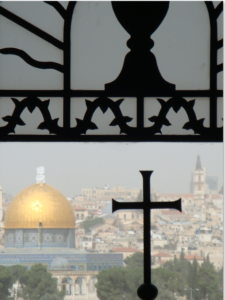 On a prayer pilgrimage to Jerusalem several years I was first introduced to the incredible history and symbolism associated with the Mount of Olives where Jesus wept. Half way down the Mount of Olives you will find the small Church of Dominus Flevit, which commemorates Jesus’s tears on the Mount of Olives. Interestingly enough, the first mention of the Mount of Olives in the Bible also involves a king crying. King David wept as he was fleeing Jerusalem because his son Absalom had seized the throne from him. 2 Samuel 15:30 says, “But David continued up the Mount of Olives, weeping as he went; his head was covered and he was barefoot. All the people with him covered their heads too and were weeping as they went up.” David eventually regained the kingdom and his rebellious son, Absalom, is supposedly buried on the Mount of Olives. 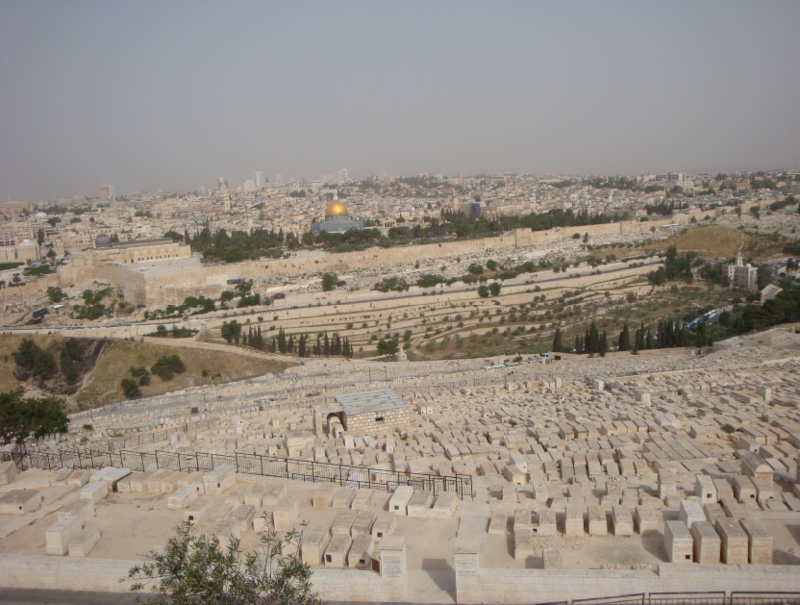 For the past 3,000 years people have wept on the Mount of Olives in the Jewish cemetery which takes up nearly the whole mountainside. 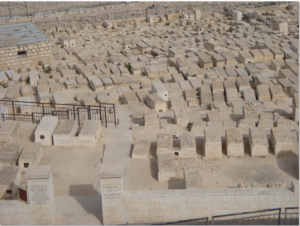 At least 1,000 years before Jesus rode a donkey down the Mount of Olives on Palm Sunday, the mountain was used as a Jewish cemetery. Today it contains at least 150,000 graves. Among these are the tombs where legend says the prophets Haggai, Zechariah and Malachi were buried. 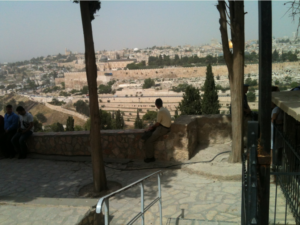 The mountain is popular as a cemetery because, according to tradition, when the Jewish Messiah comes the first ones resurrected will be on the Mount of Olives. The prophecy spoken by Jesus on Palm Sunday over Jerusalem came to pass in 70 AD when the Romans laid siege to Jerusalem and completely destroyed the Temple, leaving not a single stone standing on the other. The Western Wall where many Jews go to pray today in Jerusalem isn’t a part of the Temple building but instead simply a remnant of the retaining wall built around the Temple Mount. After the destruction of the Temple, the Mount of Olives became a place of tears and mourning once again when Jews began gathering there yearly on the date of the destruction of the Temple to mourn and lament from the vantage point offered by the Mount of Olives. If you would like to learn more about the Biblical prayer tradition of laments to express your sorrow to God for the lost or for any sorrow, see our article How to Lament.